Despite their importance in colonial settings, Jews have long been ignored in major studies of colonial history. Postcolonial Studies, on the other hand, tends to focus on the postindependence eras of the respective colonies and to neglect early modern examples. At the same time, scholars in Jewish Studies have only hesitantly made use of recent methodological turns in postcolonial thought. This volume aims to contribute to the growing field of the early modern Jewish Atlantic while stimulating new discussions at the interface between Jewish Studies and Postcolonial Studies. As a consequence, it is not our main interest to discuss the advantages and/or disadvantages of the general concept of Atlantic history from a Jewish perspective, but to use the Jewish Atlantic as a testing ground for the application of postcolonial approaches to early modern Jewish history and thought. 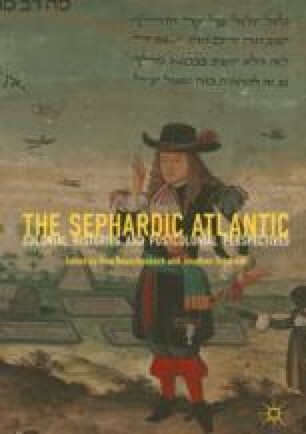 The volume’s concentration on the Sephardic Atlantic is due to the prominent role of Sephardim in Atlantic history prior to the late modern period. However, the Sephardic Atlantic as we understand the concept includes both the Iberian converso and the non-Iberian “open” Jewish Atlantic. For these reasons we rely on recent contributions that insist not only upon trans-imperial perspectives but also upon trans-religious tendencies in early modern Western Sephardic entanglements. At the same time, the volume’s contributions do not view Sephardic histories and cultures as isolated phenomena, but locate their discussions in more general contexts of Jewish and non-Jewish experiences. Topically, contributions focus on discussions about race and blood, metropoles and colonies, as well as history and memory.